happy new year! i'm attempting to use 2014 to, as TMR (who is not necessarily a life role model for me, but definitely a clothing role model) says, strip my life of irony & exist like an earnest human being again! i have some resolutions i'll be working on, but i'm going to be pulling a mary on this one, keeping all those things & pondering them in my heart. 2014 will be an ambitious & productive one for me!...if everything goes according to plan, which it rarely does. but such is life i suppose. 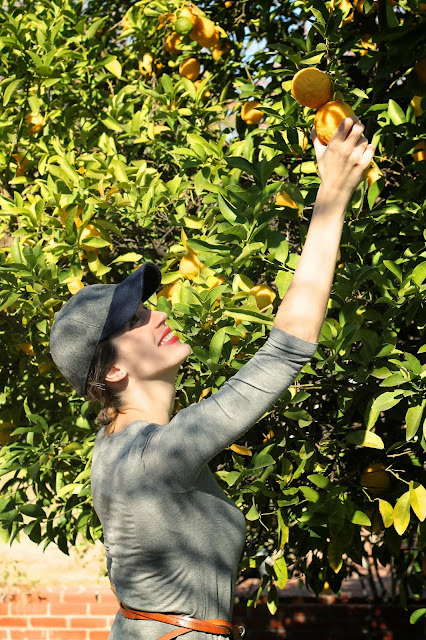 there are beautiful lemon trees in the backyard of ben's parents' house. when one lives in, like, 3 square feet in a crowded city, it's easy to forget that some people - dare i say most people? - actually live in places with backyards large enough to house fruit trees, if they so wanted to & if the weather permitted it. so whenever i come here to la canada it's a bit like "what's a backyard?" for a few minutes, & it's a bit like "you actually have space? i forgot what space feels like" for a few minutes too. but these lemon trees, i love them. of course it was a staged photo. good night!